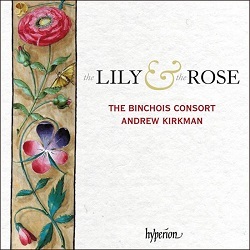 This new release complements the Binchois Consort’s earlier forays into the late medieval repertoire: CDA67868, Music for Henry V and the House of Lancaster (‘a strong recommendation’ – DL Roundup September 2011/2) and CDA68170, Music for the 100 Years War (‘a fine release … beautifully recorded and presented’ – review – Passiontide and Easter 2017). The latter included several alabaster illustrations from the period in the booklet and that practice is continued in the new release, which I’ve made a Recording of the Month in recognition of all three albums and, indeed, of their earlier releases. I’m surprised that in several cases some of the earliest are deleted: available on disc only from the Archive Service, though still readily available to download. The music here is all in honour of the Virgin Mary, two of whose images in medieval iconography were the lily and the rose. The lily regularly features in paintings of the annunciation and the rose is a symbol of love, both secular, as in Le Roman de la Rose, and sacred. Rosa mundi, rose of the world, or Rosamunde, can be the name of both the earthly and the heavenly beloved. The programme is fashioned around the central work, Walter Frye’s Missa Flos regalis (Royal Flower Mass). A recording with a very similar title from the Orlando Consort on Harmonia Mundi, The Rose, the Lily and the Whortleberry, also featured Frye’s Mass of that name, but only the Agnus Dei, preceded by his motet Flos regalis. (HMU907398). That’s download only, but it can be found for as little as £4.98/£5.98 (mp3/lossless) and it’s well worth obtaining, though there’s no sign of the illustrated booklet which came on CD. The whole (fragmentary) Mass is performed by The Clerks’ Group on Signum (SIGCD015, with Plummer Missa sine nomine – review – DL Roundup June 2009) and by the Hilliard Ensemble (ECM New Series 4376842, with other music by Frye). I see that I was a little too indulgent of the shortcomings of the Clerks’ Group, perhaps unduly influenced by the coupling, but we now have another recording of the Plummer from New York Polyphony (BIS-SACD-2037, with Masses by Byrd and Tallis and music by Gabriel Jackson). John Quinn liked that very much – review – but I had some reservations – DL News 2013/11. The new recording of the Frye is preferable to either. By now I don’t have to specify all the virtues of the singing of the Binchois Consort – they have all been noted before. The only oddity that you may notice, if this is your first experience, is that they pronounce Latin like English following the vowel shift, with long ‘e’ sounding like modern English ‘ee’. (Creedo in unum Deeum). We know that Latin pronunciation in late fifteenth century England was influenced by the vowel shift taking place in the vernacular and that sixteenth-century humanists sought to return to a purer pronunciation1, but it remains speculative as and when these developments took place. The music is sheer delight. I could listen to it for hours on end in performances of this quality, even preferring its cleaner lines in some moods to the full-blown polyphony of the following century, much as I love that too. The divisions indicated in the playlist are just pegs on which to hang the music. Thus, for example, the concluding section, Lineage of the Virgin, includes a reference to Mary as the offspring of Jesse, familiar from several carols, and to her mother Anna as Mater Matris Christi, Mother of the Mother of Christ. To round it off with the Agnus Dei, the prayer at the end of Mass to the Lamb of God makes a much looser connection with that theme. No matter: it’s the music and the performances that count. I know, however, that there are those who find fifteenth-century literature and music dull by comparison with what came later; even that great medievalist CS Lewis called it ‘the long fifteenth century’. If you don’t know the music of this period, I suggest that you try Plummer’s Anna Mater Matris Christi from the Hyperion free monthly sampler (HYP201808). Shorter samples of the other tracks are also available. Equally generously, Hyperion include the notes on their web page and, better still, the pdf booklet can be downloaded free. That’s especially valuable for the pictures of the alabaster pieces contained in it, but its free availability also means that I have not needed to go into much detail: it’s all in the notes. The recording is first-rate, especially as heard in 24/96 format, available for little more than the CD, at £13.50. If you just want mp3 or CD-quality 16-bit lossless, that comes for a reasonable £8.99. The CD is offered for £10.50. Whatever you choose, I strongly recommend against clicking the link to download from iTunes, where the mp3 is unlikely to be at the top bit-rate. Those who know the Binchois Consort’s other recordings will need no urging to go for this latest release. If you’re not sure, try that sample track; I think you’ll be persuaded. 1 In Robert Bolt’s A Man for all Seasons, the King asks More’s daughter in Latin what pronunciation she has learned. She replies that it’s as her father taught her, i.e. the new humanist fashion.